I am an admirer of currawongs. They are canny, adaptable birds with a sleek and swarthy handsomeness. To me their infectious caroling call is a signature sound of Tasmania’s mountains. And they round off their regal bearing with piercingly intelligent golden eyes. One morning as I walked past the Cascade Brewery on my way to work, I was surprised to see a currawong sitting in the roadside gutter: a prince in a pauper’s ditch. It appeared to have been injured, and despite my approach, it barely moved. It just sat there, looking at me with unblinking eyes. Mobs of his kind fly between the tall water silos on one side of the road and the temptingly full apple boxes on the other. Now and then they time their swoop poorly, and collide with passing traffic. As this one must have done. As I looked at the stricken bird, I was torn. I love animals, and hate to see them suffer. But I am no vet, and wouldn’t know the first thing about avian first-aid. Animal euthanasia is even further beyond me. I’d learned this once in New Zealand when some friends and I came across a cow that had fallen off a cliff. Its legs had been broken, and massive internal injuries had already started to bloat the poor beast. Yet somehow it was still alive. A quick bullet through the brain was called for, but we were miles from the nearest road or farmer. All we had close to hand were large rocks, which we decided to use to put the poor cow out of its misery. We failed on all counts, distressing both the cow and ourselves through this horrible and futile stoning. 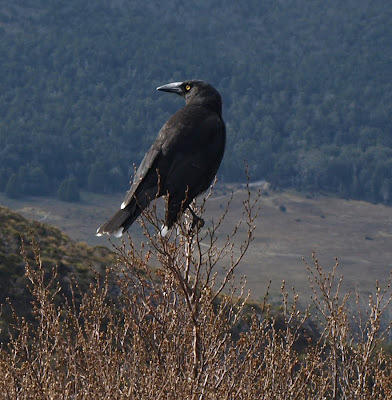 I could not inflict the same “mercy” on the currawong. Yet I also knew that if I had somehow managed to bundle up the bird and take it to my work at the Parks & Wildlife Service, the wildlife management people there wouldn’t have been able to do much for it. So I walked on. Like the Pharisee of the parable, I crossed to the other side of the road. And I hastened to my work, where I would go about the business of helping to conserve wildlife and the environment. And of course bringing about world peace, in which I also believe!